Although use of anti-VEGF agents seems safe in the general population, systemic safety concerns remain in at-risk patients. • Anti-VEGF agents can enter the circulation and reduce systemic VEGF levels. • Fellow-eye effects suggest evidence of systemic effects caused by these agents. • Systemic safety remains unclear in at-risk patients (eg, those with recent stroke or retinopathy of prematurity). At the recent annual Vit-Buckle Society meeting in Miami, Robert L. Avery, MD, presented a contrarian view of the systemic safety of anti-VEGF agents. He noted that most retina specialists who treat patients with age-related macular degeneration (AMD), diabetic macular edema (DME), and other posterior segment diseases are well aware of the excellent systemic safety data on the use of anti-VEGF drugs from registration trials. However, he pointed to several lines of evidence that suggest that there may be systemic effects of the small doses of these medicines used to treat retinal diseases. The much larger systemic doses used to treat cancer are known to increase the risk of arteriothrombotic events, and, even though the small intravitreal doses seem safe in the general population, there may be subsets of high-risk patients who could be at increased risk of similar systemic side effects. Dr. Avery presented a series of 25 patients with DME who received unilateral aflibercept (Eylea, Regeneron), and in whom there was an average 43-µm reduction in retinal thickness in the contralateral eye.6 There is inherent fluctuation in DME between visits, but some of these patients demonstrated a greater reduction in retinal thickening in the contralateral eye within 1 week than would be likely to be attributable to chance alone. A second line of evidence for systemic effects comes from pharmacokinetic studies. Dr. Avery discussed his group’s work, which measured systemic levels of the three common anti-VEGF drugs, as well as plasma free VEGF levels, at 12 time points throughout a period of 3 monthly injections in patients with wet AMD.7 Bevacizumab and aflibercept were found to linger in the bloodstream much longer than ranibizumab. These systemic drug levels correlated with markedly suppressed plasma free VEGF levels in patients receiving bevacizumab and aflibercept within the first week after administration. In addition, the much lower concentration of systemic ranibizumab correlated with a minimal reduction in systemic free VEGF levels at the same time points. What is the reason for the increased reduction of systemic VEGF following bevacizumab and aflibercept, compared with ranibizumab, injections? Dr. Avery said that it most likely has to do with the differences in structures of the three molecules. The Fc fragment, or antibody backbone, of the bevacizumab and aflibercept molecule is believed to prolong the drug’s half-life in the bloodstream by engaging with the Fc receptor on endothelial cells. This interaction enables translocation across the blood-retina barrier and is believed to rescue the immunoglobulin from catabolic elimination after entering the systemic circulation. Because ranibizumab lacks the Fc region, it persists for only a few hours in systemic circulation before undergoing breakdown. Having seen systemic effects of intravitreal anti-VEGF agents in the form of fellow eye effects and in the reduction of circulating VEGF levels, is there any evidence that these drugs have adverse effects on patients? No registration trials have shown any significant systemic safety signal, but none of these studies were powered to detect a difference in uncommon events, such as stroke, heart attack, or death. However, Dr. Avery noted that the jury might still be out in this analysis because, without inclusion of the SAE data from the LUCAS trial, the difference remains significant (RR 1.19; 95% CI, 1.06-1.34, P = .0038) with the remaining eight trials, according to this same report.13 Furthermore, the LUCAS authors noted that there was a statistically significant imbalance at baseline with respect to more than twice as many patients with a previous myocardial infarction (MI) enrolled in the ranibizumab arm than in the bevacizumab arm (P = .02).14 Of interest, during the trial, a large imbalance developed, with more cardiac SAEs in the ranibizumab arm, almost triple those in the bevacizumab arm, and this imbalance was responsible for the majority of the difference in systemic SAEs in the trial.14 To complicate the issue further, the large Cochrane analysis used estimates of the total SAEs in the LUCAS trial, which do not correlate with the recently published number of SAEs in the LUCAS trial, in part due to the method of estimation, and in part due to LUCAS including ocular SAEs in what was published as systemic SAEs.13,14 Further patient-specific evaluation of the those enrolled into LUCAS with a history of MI will help determine if the baseline imbalance in these patients contributed to the increased incidence of SAEs in the ranibizumab arm of the LUCAS trial. Stroke is an area of concern, as systemic administration of anti-VEGF agents is associated with an increased risk in cancer patients.15 Before most trials excluded patients with recent strokes, an interim analysis of the SAILOR trial raised concern that the higher dose of ranibizumab (0.5 mg) might be associated with increased risk of stroke; however, upon completion of the trial and final analysis, the imbalance was no longer statistically significant. Bressler and coworkers analyzed the risk of stroke in five randomized controlled ranibizumab AMD clinical trials (FOCUS, MARINA, ANCHOR, PIER, and SAILOR), and found no overall increased risk of cerebrovascular accident (CVA); however, when patients were stratified by their baseline risk of stroke, the subgroup with a high baseline risk of stroke had a sevenfold increase in risk of stroke during the trials with use of 0.5-mg ranibizumab compared with control.16 This was only seen in the subgroup analysis, but it lends support for the theory that there could be increased risk in predisposed patients. Finally, within the European Public Assessment Report of the safety profile of aflibercept for AMD in the VIEW studies, there is a suggestion of an increased risk of cerebrovascular events with aflibercept relative to ranibizumab.17,18 This effect was particularly apparent in patients older than 85 years. A recent large Cochrane meta-analysis of anti-VEGF treatment of DME did not show any safety signal across the entire population of treated patients.21 This study lumped patients receiving different doses of the agents and undergoing different treatment protocols—monthly, bimonthly, and as-needed—into the analysis. Dr. Avery postulated that it might be useful to assess systemic safety in this at-risk population of patients with diabetes by looking at the subgroup of these patients with maximum exposure to the anti-VEGF agents. He predefined maximum exposure as monthly injections for 2 years, and then performed a meta-analysis of randomized trials of anti-VEGF therapy for DME. Only four trials met this criteria: RISE, RIDE, VIVID, and VISTA.19,22 The analysis did not demonstrate any significant increased risk of treatment over sham for MI or arterial thromboembolism; however, analysis of the highest dose group, monthly 0.5 mg ranibizumab or 2.0 mg aflibercept, showed a threefold increased risk of death over sham (P = .003). The risk of stroke and vascular death was also elevated in this group, but only to a borderline significant level. Again, the results were from a subgroup analysis of an at-risk group (eg, patients with DME), so caution must be exercised when interpreting these results. The population studied (monthly dosing for 2 consecutive years) is clearly representative of only a small portion of patients in clinical practice, where much less frequent dosing is usually administered. In fact, many trials, such as the DRCR.net Protocol I, have shown a dramatic reduction in the number of injections required in year 2 and beyond, still maintaining excellent visual results.23,24 Also, numerous studies, such as all registration trials and meta-analyses, have shown excellent safety of anti-VEGF agents in the treatment of DME in the entire population of patients treated, not just a very high-risk subgroup. Robert L. Avery, MD, is the founder of California Retina Consultants and the associate medical editor of Retina Today. He has been a principal investigator for numerous national clinical trials and is a consultant for Alcon, Alimera, Allergan, Bausch + Lomb, Genentech, Novartis, Ophthotech, Regeneron, and Replenish. Dr. Avery may be reached at avery1@jhu.edu. 1. Avery RL, Pearlman J, Pieramici DJ, et al. 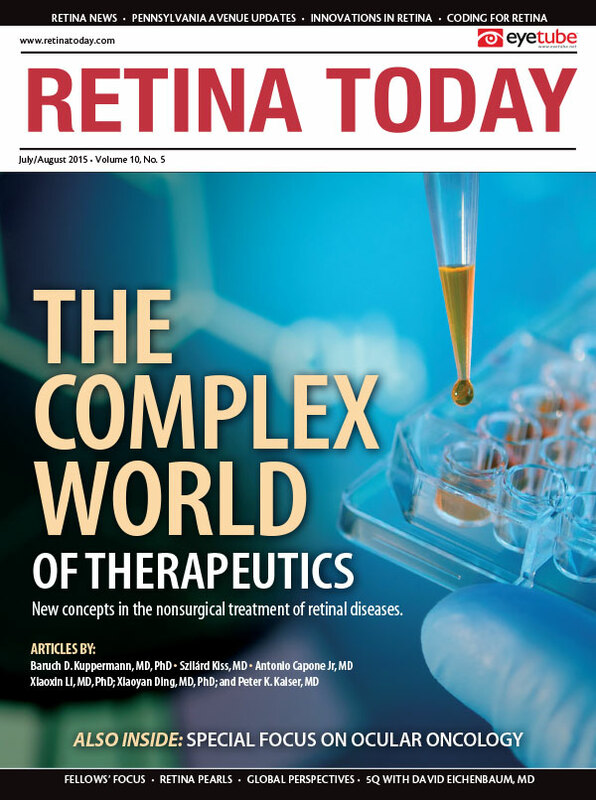 Intravitreal bevacizumab (Avastin) in the treatment of proliferative diabetic retinopathy. Ophthalmology. 2006;113(10):1695.e1-15. 2. Karaca C, Oner AO, Mirza E, et al. Bilateral effect of unilateral bevacizumab injection in retinopathy of prematurity. JAMA Ophthalmol. 2013;13(8):1099-1101. 3. Hanhart J, Tiosano L, Averbukh E, et al. Fellow eye effect of unilateral bevacizumab injection in eyes with diabetic macular edema. Eye (Lond). 2014;28(6):646-653. 4. Acharya NR, Sittivarakul W, Qian Y, et al. Bilateral effect of unilateral ranibizumab in patients with uveitis-related macular edema. Retina. 2011;31(9):1871-1876. 5. Bakbak B, Ozturk BT, Gonul S, et al. Comparison of the effect of unilateral bevacizumab and ranibizumab injection on diabetic macular edema of the fellow eye. J Ocul Pharmcol Ther. 2013;29(8):728-732. 6. Avery RL. Is a systemic effect of intravitreal anti-VEGF agents observable in the fellow eyes of patients treated for diabetic macular edema (DME)? Paper presented at: American Society of Retina Specialists annual meeting; August 9-13, 2014; San Diego, California. 7. Avery RL, Castellarin AA, Steinle NC, et al. Systemic pharmacokinetics following intravitreal injections of ranibizumab, bevacizumab or aflibercept in patients with neovascular AMD. Br J Ophthalmol. 2014;98(2):1636-1641. 8. Wang X, Sawada T, Saishin Y, et al. Serum and plasma vascular endothelial growth factor concentrations before and after intravitreal injection of aflibercept or ranibizumab for age-related macular degeneration. Am J Ophthalmol. 2014;158(4):738-744. 9. Zehetner C, Kralinger MT, Modi YS, et al. Systemic levels of vascular endothelial growth factor before and after intravitreal injection of aflibercept or ranibizumab in patients with age related macular degeneration: a randomised, prospective trial. Acta Ophthalmol. 2015;93(2):e154-159. 10. CATT Research Group; Martin DF, Maguire MG, Ying GS, et al. Ranibizumab and bevacizumab for neovascular age-related macular degeneration. N Engl J Med. 2011;364(20):1897-1908. 11. Martin DF, Maguire MG, Fine SL, et al; Comparison of Age-related Macular Degeneration Treatments Trials (CATT) Research Group. Ranibizumab and bevacizumab for treatment of neovascular age-related macular degeneration: two-year results. Ophthalmology. 2012;119:1388-1398. 12. Solomon SD, Lindsley K, Vedula SS, et al. Anti-vascular endothelial growth factor for neovascular age-related macular degeneration. Cochrane Database Syst Rev. 2014;Aug 29:CD005139. 13. Moja L, Lucenterforte E, Kwag KH, et al. Systemic safety of bevacizumab versus ranibizumab for neovascular age-related macular degeneration. Cochrane Database Syst Rev. 2014;9:CD011230. doi:10.1002/14651858.CD011230.pub2. 14. Berg K, Pedersen TR, Sandvik L, Bragadóttir R. Comparison of ranibizumab and bevacizumab for neovascular age-related macular degeneration according to LUCAS treat-and-extend protocol. Ophthalmology. 2015;122(1):146-152. 15. Ranpura V, Hapani S, Chuang J, Wu S. Risk of cardiac ischemia and arterial thromboembolic events with the angiogenesis inhibitor bevacizumab in cancer patients: a meta-analysis of randomized controlled trials. Acta Oncol. 2010;49(3):287-297. 16. Bressler NM, Boyer DM, Williams DF, et al. Cerebrovascular accidents in patients treated for choroidal neovascularization with ranibizumab in randomized controlled trials. Retina. 2012;32(9):1821-1828. 17. European Medicines Agency. European public assessment report (EPAR) for Lucentis. www.ema.europa.eu/ema/index.jsp?curl=pages/medicines/human/medicines/000715/human_med_000890.jsp&mid=WC0b01ac058001d124. Accessed June 26, 2015. 19. Nguyen QD, Brown DM, Marcus DM, et al. Ranibizumab for diabetic macular edema: results from 2 phase III randomized trials: RISE and RIDE. Ophthalmology. 2012;119(4):789-801. 20. Boyer D. Systemic Safety of Intravitreal Anti-VEGF Therapy in Select Patient Populations. Paper presented at: The Retina Society 46th Annual Scientific Meeting; September 28, 2013; Beverly Hills, California. 21. Virgili G, Parravano M, Menchini F, Evans JR. Anti-vascular endothelial growth factor for diabetic macular oedema. Cochrane Database Syst Rev. 2014;10:CD007419. 22. Do D. VIVID/VISTA for DME: two-year results. Paper presented at: The American Academy of Ophthalmology annual meeting; October 17-18, 2014; Chicago, Illinois. 23. Diabetic Retinopathy Clinical Research Network; Elman MJ, Qin H, Aiello LP, et al. Intravitreal ranibizumab for diabetic macular edema with prompt versus deferred laser treatment: three-year randomized trial results. Ophthalmology.2012;119(11):2312-2318. 24. Elman MJ, Ayala A, Bressler NM, et al. Intravitreal ranibizumab for diabetic macular edema with prompt versus deferred laser treatment: 5-year randomized trial results. Ophthalmology. 2015;122(2):375-381.